Some stats in life matter. Some don’t. 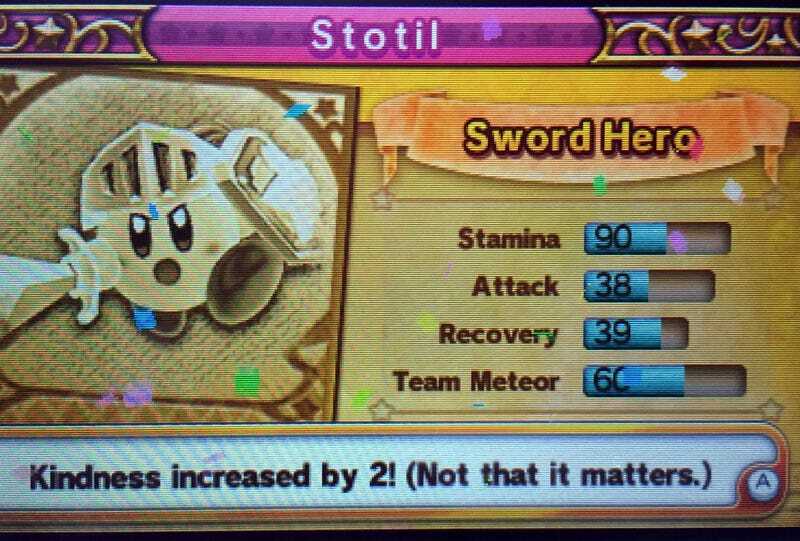 In the kill-or-be-killed world of Team Kirby Clash, the co-op mini-game in the upcoming 3DS side-scroller Kirby: Planet Robobot, your stamina, attack, recovery and team meteor stats matter. But the game’s got jokes and/or hidden profundity. When you level up in the mini-game, the game mentioned upgrades to other stats that it isn’t really tracking. It told me at one point that my “rosiness” stat has increased. Later, as you can see above, the game told me that my kindness had increased “(not that it matters. ).” Technically, Kirby’s kindness doesn’t matter. Kindness doesn’t make him swing his sword more fiercely and recover health more easily. This makes sense. Really, what good is kindness when you’re in a big battle against monsters? And think about it: What can kindness get us in the conflicts we engage? What point is there to counting kindness? What reason is there to level it up? We all know Kirby was cute. We know now that he also might be kind of a jerk. But who knew the pink puffball was so deep?